Head Lice is an infestation of the scalp by tiny and wingless insects. These tiny bugs both breed and feed off of your scalp and are extremely contagious. Head Lice are most commonly found amongst children. There are 6-12 million children that suffer from Head Lice each year. Lice often spread around easily, a simple hug to a friend or loved one who is infected is all it takes for a lice infestation to start. Chemical options are not suitable for everyone, especially young children and people with asthma. There are several natural home remedies for head lice that will help you get rid of you lice infestation. 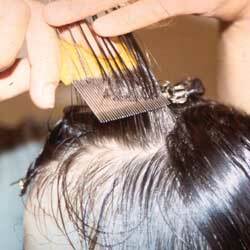 The most effective way to remove lice and nits is to comb them out using a metal lice comb. Lice Busters manufactures and sells a specially made metal lice comb that is made in Germany. The comb features a stainless steel body with special teeth to natural removes the lice and nits from the hair. In order for this home remedy to be effective, you must be thorough. Expect to spend at least an hour combing through the hair to completely get rid of lice. Visit our website at http://www.licebustersnyc.com/home-remedies/ for more Home Remedies for Lice. Lice can infest an entire family quickly; therefore, you must take care to nip the problem in the bud. Ensure that you follow procedure when it comes to washing all of your bed linens and cleaning your furniture thoroughly in order to prevent another infestation. After treating lice, keep your metal lice comb handy and check the hair regularly for lice and Nits. This will help you avoid the problem in the future.